How smart is Lady Gaga? Lady Gaga is something of an anomaly: a pretentious pop starlet. To hear her tell it, she isn’t the anonymous hookup facilitator you might assume from her robotically decadent techno hits but, rather, a savvy media manipulator engaged in an elaborate, Warholian pop-art project. She sprinkles interviews with references to Warhol’s “deeply shallow” aphorism, David Bowie, Leigh Bowery, and The Night Porter. Her outlandish, architectural outfits are meant to evoke the avant-garde designs of Thierry Mugler and Hussein Chalayan. She even has her own Factory-style crew of collaborators, which she calls the Haus of Gaga. That none of this is readily apparent in her actual songs might be part of the point. Her pretentiousness—the heady name-dropping, the high-concept video, the wild get-ups—hangs halolike around her music, encouraging us to consider the songs in a different and more radiant light. 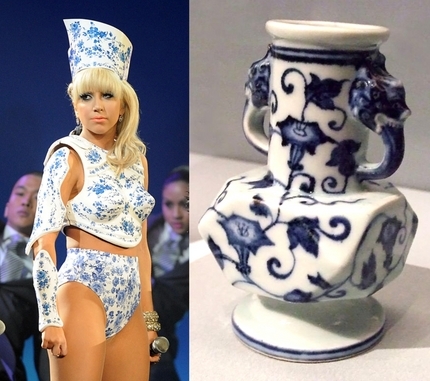 Ironically, Lady Gaga’s formative influence was as unpretentious as they come. When Gaga, 23, was just an Upper West Side girl named Stefani Joanne Angelina Germanotta, she was a Britney Spears obsessive. She would sing Spears karaoke in her bedroom and make pilgrimages to the street outside the TRL studios, she’s recalled, “just to see Britney’s fingernail in the window.” But she didn’t disavow her when she grew older and found a cooler set of artists to worship. Gaga’s adolescent infatuation with Britney Spears was, in part, anthropological: She’s talked about how she loved not only Britney’s music but the hysterical devotion it inspired in her own ‘tween peers. That seems crucial to understanding Gaga’s mission today. She wants to restore an aura of magic and mystery to the pop star—a reasonable reaction to seeing your first idol so brutally stripped of her pixie dust. Gaga’s highbrow bibliography and performance-art theatricality are key to this aura-building, but it’s to her credit that she doesn’t attempt a regal remove from the debased celebrity culture that trampled all over her favorite Mouseketeer. Instead, Gaga dives into the mud and wrestles with it. We see this in the canny way she plays off of the troubled legacy of her ‘90s teen-pop heroes. Whereas Britney debuted as a towheaded virgin whose career went on to encompass her public deflowering, Gaga debuted already-defiled: “Just Dance” is about stumbling drunkenly around a nightclub and turning your shirt inside out without knowing it. In this way, Gaga wrote her public meltdown into her very first single while remaining a deft guardian of her actual private life—a teasing pre-emptive strike. In “Poker Face,” a celebration of mind games and bedroom power plays, and “Paparazzi,” which compares love to stalkerish picture-hunting, Gaga plays a girl completely in control and completely comfortable among the dizzying, superficial signifiers of tabloid-era femininity. This control is most evident in the way Gaga explores and exhibits sexuality. Every half-naked starlet calls her patent-leather thongs “empowering” or argues that her raunchy odes to sexual compliance are, in fact, proof of strength. Gaga trots out similar lines, but there’s something fresher at work with her, too. She talks in interviews about wanting to die husbandless, surrounded by stage props, and about wanting to scare boys rather than arouse them. She wears skimpy clothes, but they blunt, distort, and sharpen the curves of her body—the gender sabotage she admires in Bowie and Grace Jones airlifted to 2009. On the cover of the new Rolling Stone, Gaga appears naked beneath a massive canopy of frizzed-out hair, sprouting bubbles from her skin, with her lips painted to resemble the severely exaggerated pucker of a blow-up doll. The image captures something essential about Lady Gaga: She’s an exquisite horror.